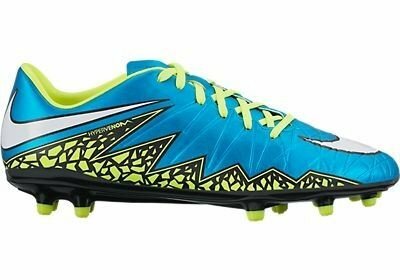 PRODUCT DESCRIPTION WMNS Nike Hypervenom Phelon II FG - (BLUE LAGOON/WHITE-VOLT-BLACK) SUPERNATURAL AGILITY Nike HyperVenom Phelon II (FG) Women's Firm-Ground Football Boot ENHANCED AGILITY AND TOUCH. The Nike HyperVenom Phelon II (FG) Women's Firm-Ground Football Boot is built for unrivaled agility on the pitch with an anatomical fit that locks down your foot. Its textured, leather-like upper enhances ball touch for maximum control. The anatomically correct shape creates a glove-like fit to enable agility. Asymmetrical lacing system expands the ball control area and strike zone. Leather-like upper is textured for improved touch. Molded, perforated sockliner cushions to help reduce stud pressure. TPU plate provides support and a responsive feel.